While Europe was experiencing its Dark Ages, a period of intellectual, cultural and economic regression from the sixth to the 13th centuries, Africans on the other hand were experiencing an almost continent-wide renaissance after the decline of the Nile Valley civilizations of Egypt and Nubia. The leading civilizations of this African rebirth were the Axum Empire, the Kingdom of Ghana, the Mali Empire, the Songhai Empire, the Ethiopian Empire, the Mossi Kingdoms and the Benin Empire. The Aksum or Axum Empire was an important military power and trading nation in the area that is now Eritrea and northern Ethiopia, existing from approximately 100 to 940 A.D.
At its height, it was one of only four major international superpowers of its day along with Persia, Rome and China. Axum controlled northern Ethiopia, Eritrea, northern Sudan, southern Egypt, Djibouti, Western Yemen, and southern Saudi Arabia, totaling 1.25 million square kilometers, almost half the size of India. 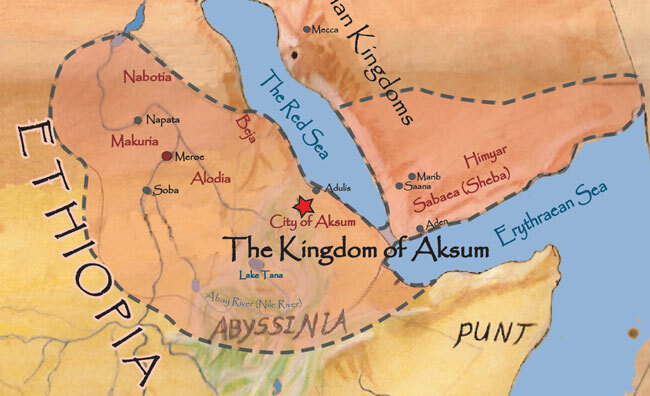 Axum traded and projected its influence as far as China and India, where coins minted in Axum were discovered in 1990. Axum was previously thought to have been founded by Semitic-speaking Sabaeans who crossed the Red Sea from South Arabia (modern Yemen) on the basis of Conti Rossini’s theories but most scholars now agree that when it was founded it was an indigenous African development. Centered in what is today Senegal and Mauritania, the Kingdom of Ghana dominated West Africa between about 750 and 1078 A.D. Famous to North Africans as the “Land of Gold,” Ghana was said to possess sophisticated methods of administration and taxation, large armies, and a monopoly over notoriously well-concealed gold mines. The king of the Soninke people who founded Ghana never fully embraced Islam, but good relations with Muslim traders were fostered. Ancient Ghana derived power and wealth from gold and the use of the camel increased the quantity of goods that were transported. One Arab writer, Al-Hamdani, describes Ghana as having the richest gold mines on Earth. Ghana was also a great military power. According to one narrative, the king had at his command 200,000 warriors and an additional 40,000 archers. 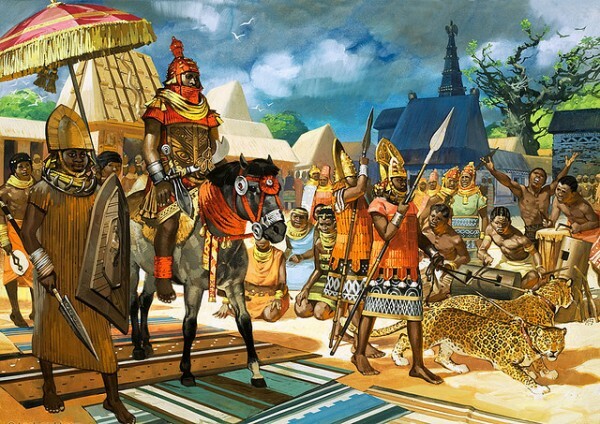 After the fall of the Kingdom of Ghana, the Mali Empire rose to dominate West Africa. Located on the Niger River to the west of Ghana in what is today Niger and Mali, the empire reached its peak in the 1350s. 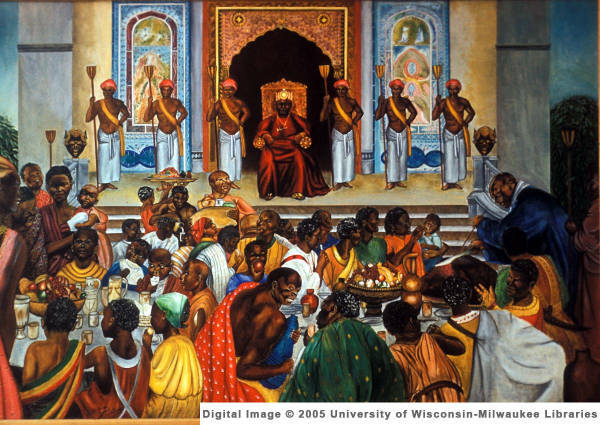 The Mali Empire was founded by Mansa (King) Sundiata Keita and became renowned for the wealth of its rulers, especially Mansa Musa. He was the grandson of Sundiata’s half-brother, and led Mali at a time of great prosperity, during which trade tripled. 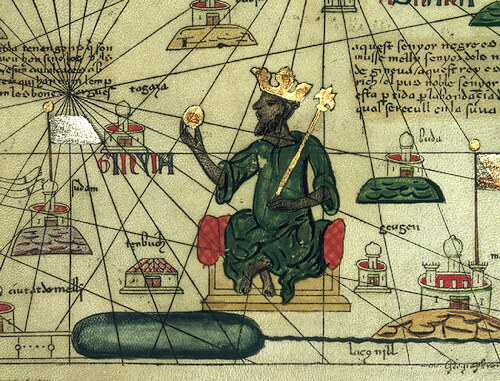 During his rule, Mansa Musa doubled the land area of Mali; it became a larger kingdom than any in Europe at the time. The cities of Mali became important trading centers for all of West Africa, as well as famous centers of wealth, culture and learning. Timbuktu, an important city in Mali, became one of the major cultural centers not only of Africa but of the entire world. Vast libraries and Islamic universities were built. These became meeting places of the finest poets, scholars and artists of Africa and the Middle East. The Kingdom of Mali had a semi-democratic government with one of the world’s oldest known constitutions – The Kurukan Fuga. The Kurukan Fuga of the Mali Empire was created after 1235 by an assembly of nobles to create a government for the newly established empire. The Kurukan Fouga divided the new empire into ruling clans that were represented at a great assembly called the Gbara. The Gbara was the deliberative body of the Mali Empire and was made up of 32 members from around 29 clans. They were given a voice in the government and were a check against the emperor’s (mansa’s) power. It was presided over by a belen-tigui (master of ceremonies) who recognized anyone who wanted to speak including the mansa. The Gbara and the Kurukan Fuga remained in place for over 40o years until 1645. According to Wikipedia, Disney’s “Lion King” movie was based on the real life narrative of Mansa Sundiata Keita. The Songhai Empire, also known as the Songhay Empire, was the largest state in African history and the most powerful of the medieval west African states. It expanded rapidly beginning with King Sonni Ali in the 1460s and by 1500s, it had risen to stretch from Cameroon to the Maghreb. In 1360, disputes over succession weakened the Mali Empire, and in the 1430s, Songhai, previously a Mali dependency, gained independence under the Sonni Dynasty. Around thirty years later, Sonni Sulayman Dama attacked Mema, the Mali province west of Timbuktu, paving the way for his successor, Sonni Ali, to turn his country into one of the greatest empires sub-Saharan Africa has ever seen. 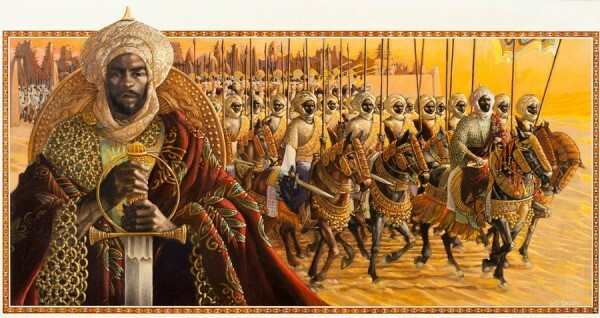 Perhaps, it’s most popular leader was Muhammad Askia the Great. At its peak, the Songhai city of Timbuktu became a thriving cultural and commercial center. Arab, Italian and Jewish merchants all gathered for trade. By 1500, the Songhai Empire covered over 1.4 million square kilometers. The Ethiopian Empire also known as Abyssinia, covered a geographical area that the present-day northern half of Ethiopia covers. It existed from approximately 1137 (beginning of Zagwe Dynasty) until 1975 when the monarchy was overthrown in a coup d’état. In 1270, the Zagwe dynasty was overthrown by a king claiming lineage from the Aksumite emperors and, hence, Solomon. The thus-named Solomonic Dynasty was founded and ruled by the Habesha, from whom Abyssinia gets its name. The Habesha reigned with only a few interruptions from 1270 until the late 20th century. 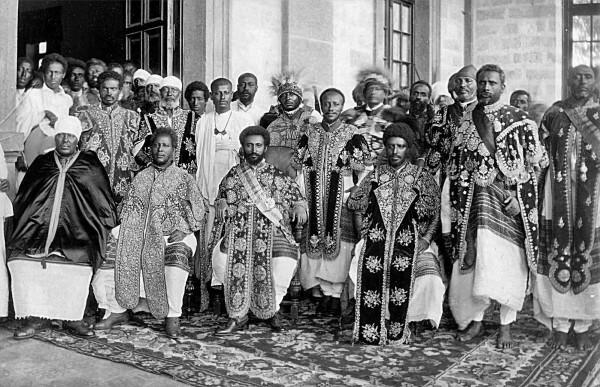 It was under this dynasty that most of Ethiopia’s modern history occurred. During this time, the empire conquered and incorporated virtually all the peoples within modern Ethiopia. They successfully fought off Italian, Arab and Turkish armies and made fruitful contacts with some European powers, especially the Portuguese, with whom they allied in battle against the latter two invaders. The Mossi Kingdoms were a number of different powerful kingdoms in modern-day Burkina Faso which dominated the region of the Upper Volta River for hundreds of years. Increasing power of the Mossi kingdoms resulted in larger conflicts with regional powers. The Kingdom of Yatenga became a key power attacking the Songhai Empire between 1328 and 1477, taking over Timbuktu and sacked the important trading post of Macina. 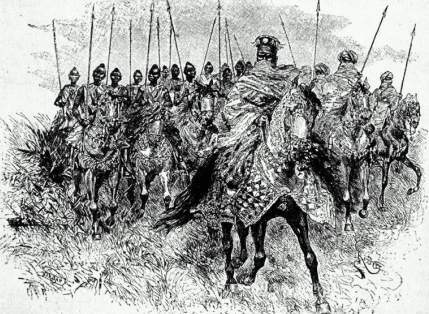 When Askia Mohammad I became the leader of the Songhai Empire with the desire to spread Islam, he waged a Holy war against the Mossi kingdoms in 1497. Although the Mossi forces were defeated in this effort, they resisted attempts to impose Islam. Although there were a number of jihad states in the region trying to forcibly spread Islam, namely the Massina Empire and the Sokoto Caliphate, the Mossi kingdoms largely retained their traditional religious and ritual practices. 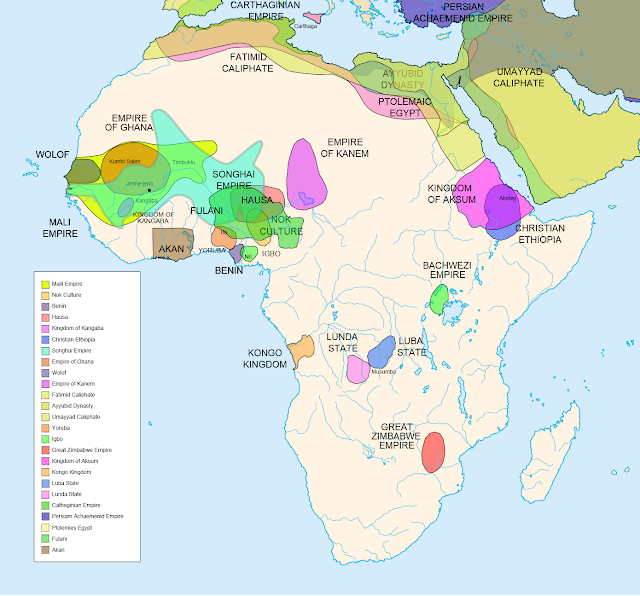 Being located near many of the main Islamic states of West Africa, the Mossi kingdoms developed a mixed religious system recognizing some authority for Islam while retaining earlier African spiritual belief systems. When European merchant ships began to visit West Africa from the 15th century onward, Benin came to control the trade between the inland peoples and the Europeans on the coast. When the British tried to expand their own trade in the 19th century, the Benin warriors killed their envoys.